Over the years we have been very fortunate to have had the opportunity to work on the most amazing engineering endeavors. Many of our projects are custom made to incredible requirements. We pride ourselves with engineering excellence, clever designs, quality, and impeccable workmanship. We are well respected among industry professionals and scholars. If you are looking for an expert in the vacuum industry, we would like to have the opportunity to work with you. You will be astonished to learn what we can accomplish together. Make yourself at home and feel free to browse around. Click on the links below to find out how Sanatron Vacuum Systems provide tremendous value. A pharmaceutical manufacturer contacted us to build them a large vacuum storage system for their pharmaceutical products. They were looking for as much footprint as possible which is why they got a two-chamber system from us. They needed a total of 6 shelves per chamber including trays. Finally, they were looking to have both chambers to be placed on a table frame assembly with lockable swivel casters. 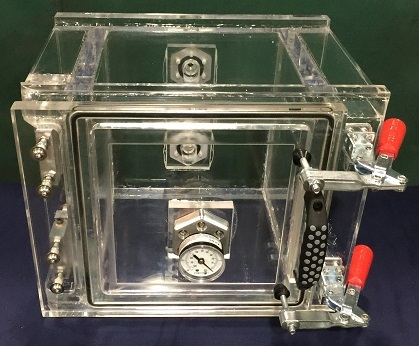 What you are seeing is a two chamber system, each chamber is our 20 inch cube acrylic vacuum chamber, front load hinged door. Each chamber can be accesses independently while the other is under vacuum. The trays can be easily loaded and unloaded. This whole system can also be moved to anywhere in their facility. 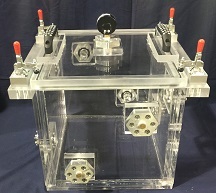 This is a custom acrylic vacuum chamber build for a high volume manufacturer of parts which are fabricated using vacuum extrusion techniques. The challenge was to build a vacuum chamber system which mated on two perpendicular surfaces; on the bottom and on the rear of the chamber. This was accomplished by incorporating a double gasket mechanism on the bottom and incorporating a clamping mechanism on the rear. 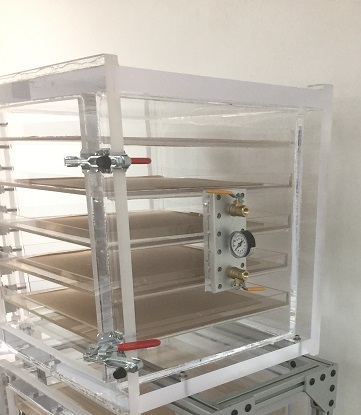 This was an interesting project where one of our customers needed to test wires up to 44 inches long within a high altitude simulation environment. In addition to testing wires, several other electric connectors required altitude testing as well. The altitude requirements were 100,000 feet (30.510 km) which corresponds to 8.36 Torr - a piece of cake when it comes to the vacuum requirements of our chambers. 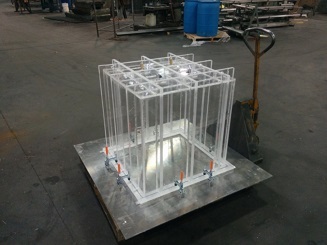 This custom job was a modification to our standard acrylic vacuum chambers. When it comes to working with the Us Military, they want all specs to be met 110% and they want it yesterday. The military does not mess around which is why they came to us since we know how important it is to meet specs and ship fast. 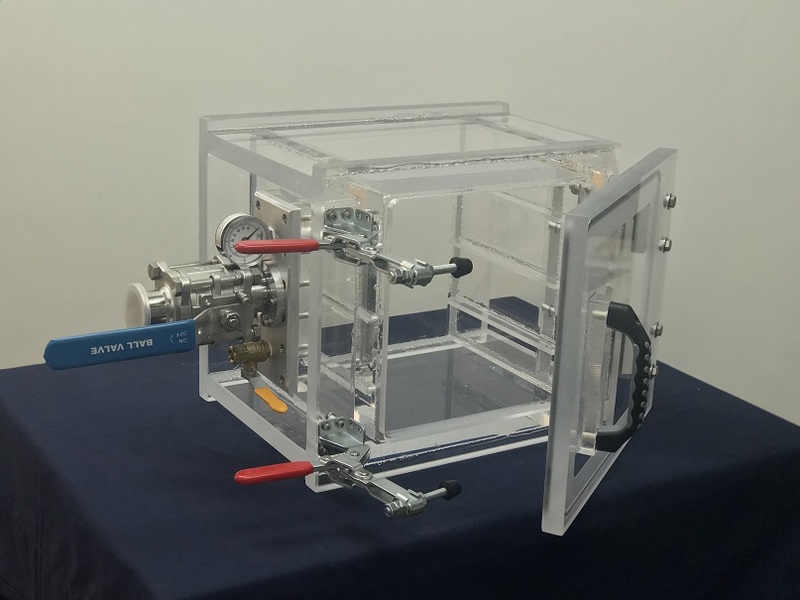 This vacuum chamber is a modification to our basic acrylic vacuum chamber 12 inch, removable lid model; except that our customer requested additional ports and electrical feed-through for testing of electrical equipment under vacuum. You know, I wish we would have asked them for more details on what they were doing with this chamber; their short and concise answer was that they were using our chamber to perform scientific work on the subjects of: lithium ion batteries, thin films, fuel cells, super-capacitors, and nano-materials testing in a vacuum environment. This was actually not a vacuum chamber per se but more like a vacuum purge unit. Our customer, who is from academia. had gotten a custom made CNC laser beam welding unit. They were looking for a way to purge the surrounding air and fill it with inert gas in order to prevent oxidation and contamination from the laser heat source. 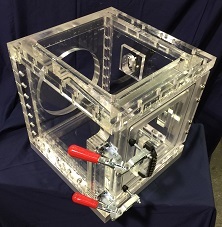 We suggested several small chambers with a viewport for their laser welder. However, they wanted to encase the whole CNC unit inside a chamber which would be lift able by a crane for easy access. This cylindrical vacuum chamber is utilized for testing high potential voltage cables for potential discharging at higher altitudes. Since air is acting as an insulator at sea level, no electric discharge is present at lower altitudes. However, once the pressure is decreased as a result of higher altitudes, less air is present to act as an insulator. This creates a problem because if an electric discharge happens, it can result in catastrophic failure of electrical components, especially if these components are critical. It is therefore very important to test these cables for discharge by using a vacuum chamber to simulate an air pressure at higher altitudes. The vacuum requirements for this test where only to go to 35,000 feet pressure equivalent which is about 165 Torr. 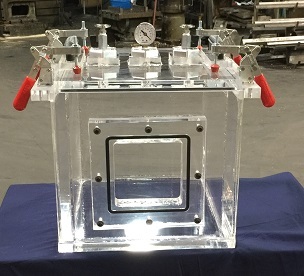 This is our standard 10 inch cube inside dimensions chamber made for vacuum sample preparation and laboratory testing. Our client needed a vacuum chamber that is high performing and robust which is why they came to us. This chamber has a vacuum rating of 0.075 Torr (75 micron) absolute pressure. Included as a standard are: a vacuum valve, a vent valve, a vacuum gauge, two toggle clamps, two hinges, one handle. Our client performs a wide array of microfluidic testing in their laboratory. 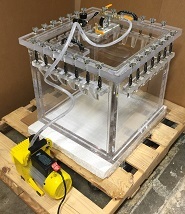 The requirements were 1. to install injection ports which are connected to a syringe pump outside of the chamber, 2. 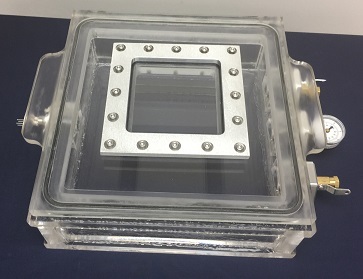 A gas port to pump gas such as carbon dioxide, helium, or argon into the specimen, 3. an electric feedthrough port in order to connect a heat plate and heat the sample inside the chamber during vacuum tests. 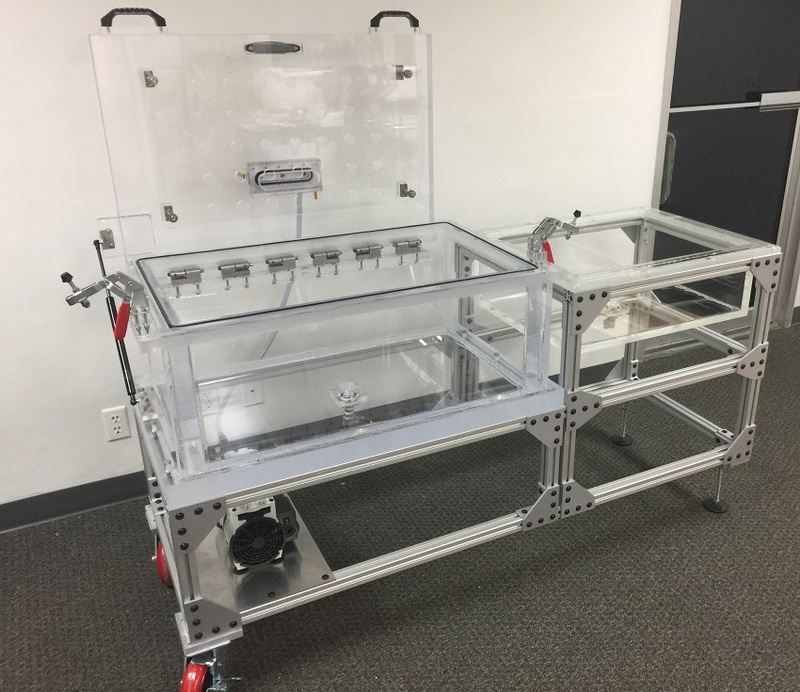 This was a fun project as it involved a custom chamber with the following items: a front door, two airflow diffusers (inside plate with lots of holes), four spare ports, top hole and bottom hole with a gasket to allow for different specimen to be placed, clamped, and tested. 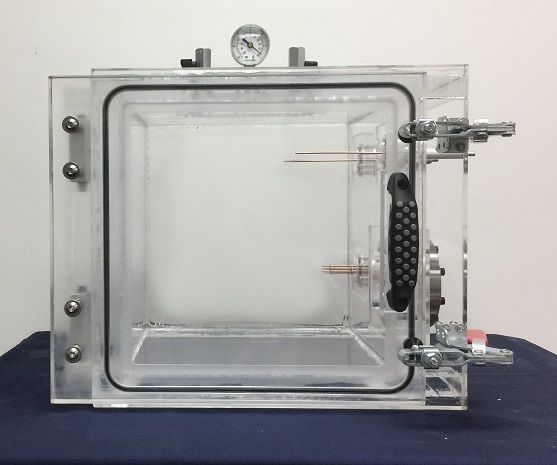 What you are seeing here is our crystal clear acrylic vacuum chamber, hinged side door with clamps. 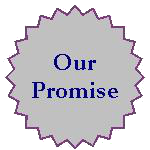 In addition, our client has asked us to add 1. A quantity of two high power feedthroughs on the top right wall, 2. An 8-pin power connector, and 3. a multi-pin feed through. 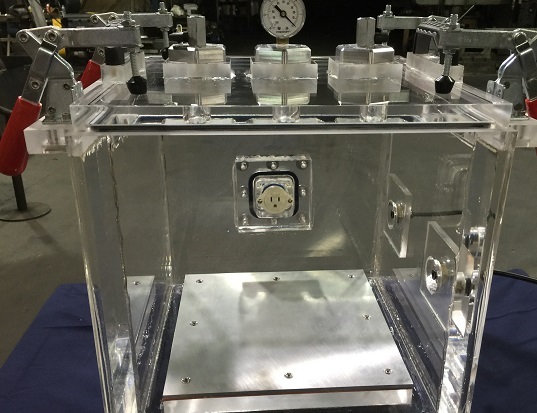 These vacuum feedthroughs enable the routing of electrical power and signals from the outside of the chamber into the inside of the chamber without disrupting the vacuum. A Vacuum Wobble Stick And A Vacuum Linear Actuator are used to interact with chamber interiors while the chamber is closed and under vacuum. 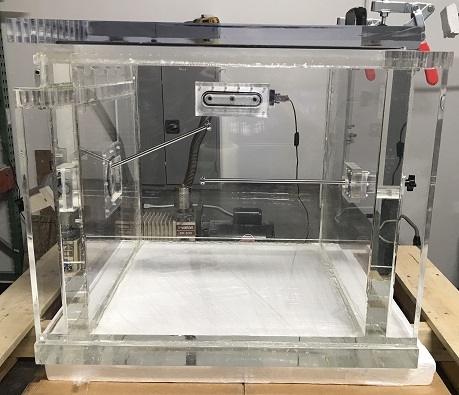 This is our standard 20 inch acrylic vacuum chamber, hinged front door that features two types of vacuum motion, manipulation, and interaction while specimen is under vacuum. This vacuum chamber was built to perform Solar energy research on Photovoltaic Cells. We had some constrains with regards to the outside dimensions of the chamber. As you can see, it could not be too tall because it had to fit into our clients assembly jig. 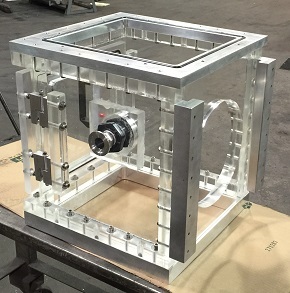 We therefore removed our standard lid handles and machined the handles themselves right into the acrylic chamber lid. Concurrently, we also removed our 3-Port Plate that houses the vacuum valve, the venting valve, and the vacuum gauge and moved each of them to the side wall of vacuum chamber. 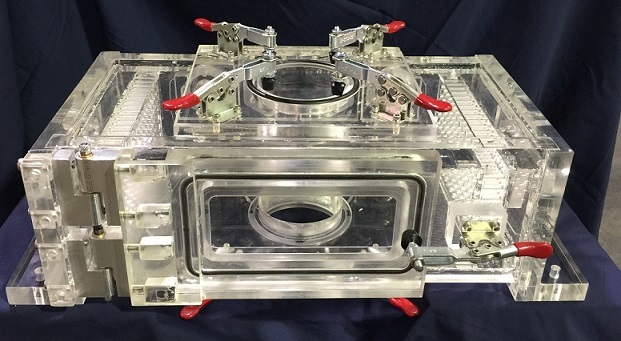 Finally, a way to connect electrical signals and power to the interior of the vacuum chamber from the outside, while the Solar Cell is under vacuum, was to provide an electrical feedthrough. This electrical power feedthrough was placed on the opposite wall of the vent valve, vacuum valve, and vacuum gauge. This is your acrylic vacuum and pressure chamber. And as you can see, its has two handles, its has 27 of these thumb screws which clamp the lid when you pressurize the chamber. It has a pressure regulator, a vent valve, a vacuum pressure valve, and a pressure valve, and course a vacuum gauge. So the operation is really simple what you need to do is you need to open this valve to vent any pressure or vacuum that is already in the chamber and when you are ready to go. Then, the first thing that you want to do is to close the venting valve. Then, we are going to start with vacuum first and what you need to do is you need to close your pressure valve and only leave your vacuum valve open. Also keep in mind, that you have your hole, that 30mm hole that you requested, this is on that wall over there. So this is it, when you are pulling vacuum, you will not need these clamps you can just leave them open if you want, but for demonstration purposes, I figure I start with the clamps on. Let me go ahead and connect your vacuum pump now and well pull a vacuum on this one.